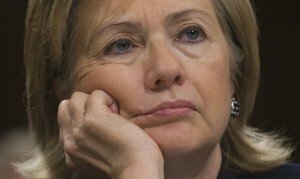 Here’s the story behind the drive by the Inspector General of the State Department and the Intelligence Community Inspector General for the Justice Department open a full investigation into Hillary Clinton’s use of a private email account while she held the position of secretary of state. Government investigators discovered classified information on the private email account that Hillary used while secretary of state, stating “unequivocally” that those secrets never should have been stored outside of secure systems. The inspectors general of the State Department and the nation’s intelligence agencies said the information they found was classified when it was sent and remains so now. Information is considered classified if its disclosure would likely harm national security, and such information can be sent or stored only on computer networks with special safeguards. The inspectors have not revealed which of Clinton’s emails contained classified data, though the State Department has redacted portions of email it has released, and the FBI demanded data in some emails pertaining to the security situation in Libya be withheld. Clinton has said for months that she kept no classified information on the private server that she set up. Her campaign said Friday that any government secrets found on the server had been classified after the fact. There are multiple holes in Clinton’s latest set of excuses. To begin, she has stated there was nothing classified on her server. It appears now there was. The source is not a partisan attack dog, but the State Department’s own inspector general and the intelligence community. She violated national security, which require cleared individuals, such as Hillary, to protect sensitive information. Exposing classified data is a crime; that is what Chelsea Manning and Edward Snowden are accused of doing. It does not matter if the info can be proven to have reached the media or an adversary, the crime is the exposure itself, not the results. A person in Hillary’s position, and certainly with her claimed experience in government, should know what is and is not classified, sensitive or otherwise needs to be protected. In my own 24 years with the State Department, I saw that almost everything that reached the secretary’s office needed to be classified, either because of the contents itself, or because it was part of the tiny fraction of information that bubbled up that high. Of all the issues in the world, an adversary knowing what the secretary was personally focused on, or how the data was being presented to her, was valuable in its own right. Some/much of the information Hillary was dealing with originated within her inner circle, particularly email sent between her and her closest advisors that helped shape her decisions. It is the originating person that is charged inside State with assigning a classification. If Hillary’s staff did not assign a classification, well, then one was not technically included with the data. But that’s a fudge; it is the data itself that matters, with or without a label, and as part of the responsibility for holding a clearance a person is expected to make judgements to protect information. Hillary knew how sensitive the information was at times. It is a veneer of deniability. There have also been multiple public cases where the government has taken action against individuals because they “should have known unclassified” data “should have been classified” and thus protected. Google up those of TSA’s Robert MacLean, NSA’s Thomas Drake and, sadly, my own. All of us were punished, fired or threatened with jail over the alleged release of unclassified data that the government deemed ex post facto should have been considered classified. This is not speculation, it is precedent. Criminal? Maybe. Irresponsible? Likely. Not very presidential? Certainly. God..that picture is perfect. As if she’s saying.. “Sheeezus..don’t these people ever learn”. Even if they prove something, nothing will come of this, except a grilling, and a $1/3 billion dollar price tag. Of course..it will generate a lot of campaign funds on her behalf. Peter – please try to help the MSM understand how the USG classification process works. As you point out, the originator is obliged to consider the content and use appropriate classification markings, and to avoid using an unclass system for info which should be classified. Same goes for phone calls. If HRC or her staff disregarded this, and it sounds as though they did, they should be subject to further investigation and possible penalties. You are correct that almost ANY email to or from the Secretary is usually classified, especially if it touches on policy, information from analysts, or conversations with foreign officials. HRC’s excuse that emails were marked classified when she sent or received them is a classic dodge, but I’m afraid that many journalists and the general public won’t realize that. Can you write a clear and objective piece, based on your professional knowledge, for the Post or similar on this? I’ll keep trying. The MSM seems uninterested in “nuances.” I’ve spoken on background to a handful of reporters who are either focused on purely criminal acts that can be tried in court or nothing, claim I am imagining things, say this is all “too complicated” or who won’t understand how a classification is actually created/assigned. And those are the reporters who even care to ask; most seem to be polarized into saying this is all a rightwing attack, or making it into a rightwing attack. Unclassified material also had a classification marking!!! Eternal Flamer LIBERAL, here! : W.T.F.? Hilly’s A HACK!! And A CROOK (for federal employees, the SD-separate e-mail system itself Was ILLEGAL!!!). Geez. I thought everyone knew that it depends upon who releases (or shares) the classified information as to whether or not it is unlawful. Not sure of your point, but if information of a Class or sensitive nature is on a public, unclass system, say a personal server of great interest to the Chinese, then that is a security violation. The IGs say some of the material originated with an intel agency. That means Hillary cannot declassify or release it no matter what, only the originating agency. That’s a violation. If emails discussing policy or decisions were traded on an open network without any classification applied, that’s a violation. Some of this may rise to criminal, some may stay regulatory in violation. That’s for a prosecutor or security board to determine, and of course they need to conduct an investigation to do so. An investigation is not a witch hunt; investigations happen all the time on these matters inside State. The real question for the rest of us is whether what happened suggests the maturity of judgement and interest in protecting America’s secrets that one would want in a Commander in Chief. Veneer of deny a hillbilly? Denying a hillbilly (Hill abd Bill) a ticket to the White House seems spiteful and elitist. Shame on you Peter. They are good people- good for nuthin’ of course. Good people that need to go away and stay away….forever. BTW–good is a relative term. The DS Flying Monkeys have to burn the witch. If they don’t, then all State employees who have been charged with similar violations will have a good case for selective prosecution. BURN, BABY, BURN.